I'm working on a Local guy's '66 140 Corsa. 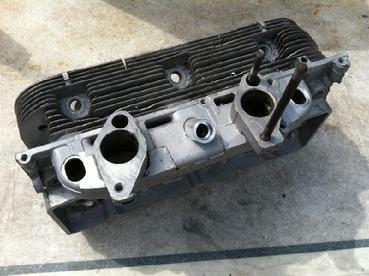 I had rebuilt the heads and added the injector bungs a couple of years ago. The engine was rebuilt in Austin and consists of a stock stroke, stock bore, 260 cam, stock 140 exhaust tubes. I will change the exhaust from a dual muffler system to a single using modified u pipes routing to the right side. The muffler is a 2 1/4" Flowmaster. I asked the owner what he wanted for an intake and he said he wanted something that looked cool. So I came up with this crossover that fits on the stock carb openings. The center section is from a '98 Porsche Boxster. I adapted the linkage and built a bellcrank piece to marry the stock Corvair throttle rod to the throttlebody. More to come as I get closer to firing the engine for the first time. Intake towers machined, ready to weld up. This 140 head is getting port injection. I've just started the machining process. The custom injector bungs will be welded to the manifold and a pair of fuel rails cut to fit. These heads still need new guides, deep, high press seats and the quench welded and flycut. I'll do all the welding at the same time. So far I have done this on 2 sets of 140 heads and a pair of 95 heads. The 95 heads will be used on a 92MM big bore turbo engine. 65 140 head with custom injector bungs ready to weld. Towers welded but need end caps. Connector pipes from towers to center being finished. Now starting the linkage design. Changed the turkey roaster to a 65 model as the heads are 65. The linkage is finished, no mods to the stock throttle rod. Works perfectly. Wiring the ecu. Ignition components mounted. Plug wires are finished. Here is a short video of the engine starting for the first time since rebuild and EFI installation. Fired up after 2 revolutions. Lifters noisy, ecu has a very basic tune just to get the engine running. I ran it for about 40 minutes at a fast idle and blipping the throttle. The lifters quieted up after 30 min. This is a very healthy sounding engine. I'll post another video once I get a little tuning done. And now the engine sounds better with the lifters pumped up. Day 2 after dialing in the idle and setting a couple of items in the tuning software. I have yet to adjust any mixture or timing points. I drove this car the day after this video was recorded. It runs great. Has nice power and is extremely smooth. It only has 2 miles on the rebuild so I need to drive it easy for a couple of weeks while I adjust the mixture and recheck the ignition timing.